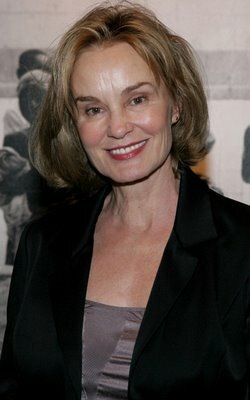 Jessica Lange...What has happened to her eyes? This is a photo of Jessica Lange last night at the 17th Annual Human Rights Watch International Film Festival. It appears to me that she has had a pretty aggressive browlift, causing her eyebrows to be so high that she looks surprised and unnatural. She likely has Botox in her forehead as well. There are two types of browlifts, the traditional open browlift with a long scar and the endoscopic browlift. The endoscopic browlift is much less invasive, but arguably doesn't have as much staying power since the scalp is not literally cut out like in a traditional open browlift. In my opinion, most of the people who have their brows excessively elevated have had a traditional open browlift because it is much easier to pull things too high with this type of lift. The giveaway is the scar, which extends from ear to ear or along the front hairline. I haven't performed one of these in two years, as the endoscopic technique is really the most state-of-the-art technique nowadays. The old-style browlifts are best reserved in general for people who have tried the endoscopic technique without good results, as it is one of the most permanent plastic surgeries there is. On the bright side with Jessica Lange, her neckline looks great and is likely the result of a well-done facelift. Oh no. She's getting those creepy cat eyes from all the lifts. It really is too bad. She used to have such a unique and interesting natural beauty, much like Susan Sarandon.